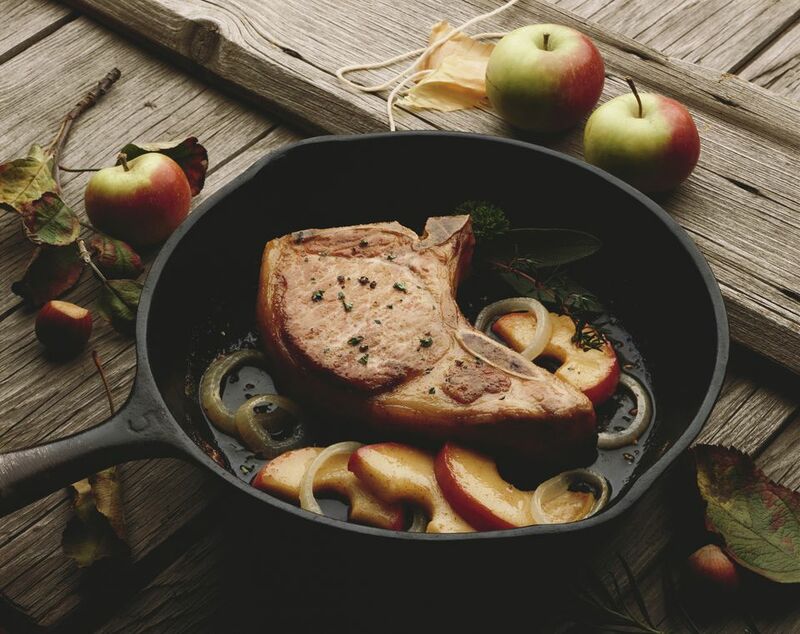 Pork and apples make an excellent match, and this nicely seasoned pork chop skillet is a tasty confirmation. Bone-in or boneless pork chops are browned and then simmered to perfection with onion slices, seasonings, and apple wedges. Serve this delightful pork chop dish with hot cooked rice or potatoes for a great-tasting family dinner. Add enough oil to a skillet to coat the bottom of the pan. Place the skillet over medium heat. When the oil is hot, add the pork chops. Cook for about 6 to 8 minutes, or until browned on both sides. Place the onion slices on the chops. In a bowl, combine the chicken broth, dry mustard, salt, allspice, and pepper. Pour over the pork and onion. Bring the chops to a boil. Reduce heat to low, cover, and simmer for about 20 minutes. Arrange the apple wedges over the pork chops, cover, and cook for about 3 to 4 minutes longer, or just until apple is tender. If desired sprinkle with parsley just before serving. Pork Chops With Pears: Stand a firm Bosc pear up and slice vertically around the core. Discard the core and dice the pear pieces. Use two pears, if desired. Replace the apples with the diced pear. Add a sliced fennel bulb to the pork along with the onions.